Tuve Hall has living options for upperclassmen and first-year students. Tuve Hall features newly renovated double rooms and offers exciting theme communities on each floor. Endeavor Living Community- Designed for first year students who wish to dig deeper into vocation and faith. Flexible Housing- This floor is available for students in any class year and will focus on personal growth and development with an emphasis on overall well-being. Serve. Grow. Lead.- A community for sophomores, juniors and seniors who want to develop their leadership skills through mentorship and service. Rooms in Tuve Hall are 11' 8 1/4" x 13' 6 3/4". Tuve is staffed by 6 Viking Advisors (VAs) and one Hall Director. 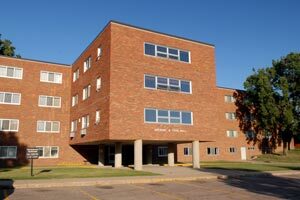 VAs On Call are required to be in the building and accessible to students every night after 7 p.m.
Named for Augustana's eighth president, Anthony G. Tuve, this three story building is a co-educational Residence Hall.